The 1977 Jubilee Classic TT, an unknown Irish rider caused one of the biggest upsets ever seen at the TT by beating Honda works rider Mick Grant to a famous victory. He rode a comparative shed of a 750 Yamaha, forced to hold on to a loose over sized petrol tank with his knees for the duration of the race. It was the beginning of a legend. I was there to witness it, eight foot up a tree at Governors Bridge, even though I was only 10 years old I still remember it, I'll never forget it, or the 25 other wins I was lucky enough to have seen. The tragic accident that took Joeys life on the 2nd of July 2000 is still painfully fresh in the memory. 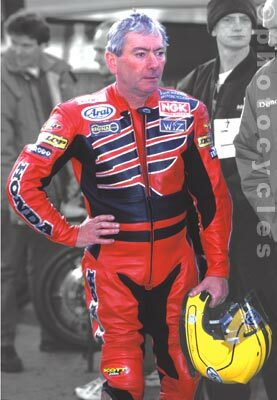 Joey Dunlop was one of the few people I really admired, a living legend, an unassuming hero who just couldn't understand all the fuss that surrounded him. I will not attempt a long epilogue of facts and figures charting Joey's whole career, as this is well documented by far more knowledgeable people than me. What I have to contribute is a lot of unseen photographs of Yer Maun taken at the TT from the early '80s right up to his illustrious final year. A few you might have seen before, most have been stored away, almost forgotten - that was until the 2nd of July 2000. Now, to me, they are simply priceless. This web site contains copyrighted works. Copyright on all works contained within this web site remains with David Collister. For permission to reproduce works contained within this site contact David Collister.